STAFFORD — U.S. Sen. Ted Cruz, R-Texas, formally began his re-election campaign Monday, hitting the road extolling Lone Star State exceptionalism — especially in the wake of Hurricane Harvey. 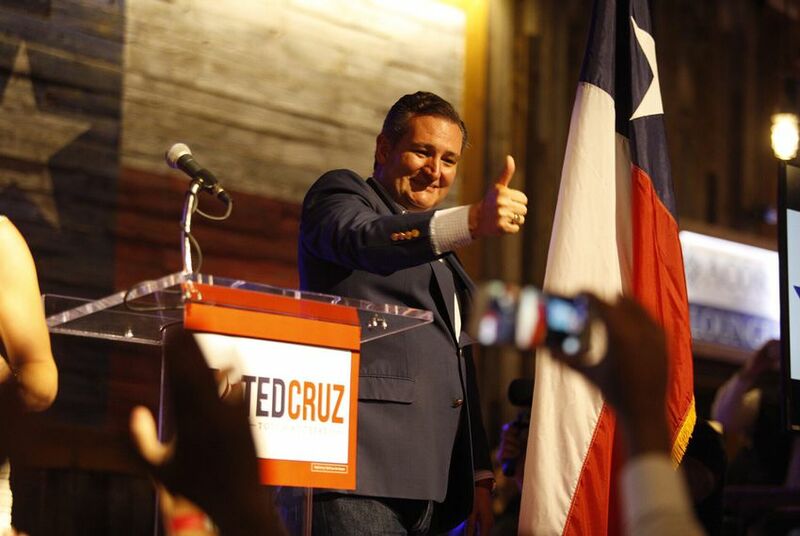 It was an ostensibly unifying message that complemented Cruz’s new campaign slogan — “Tough as Texas” — and punctuated a period of home-state re-engagement following his unsuccessful 2016 presidential campaign. Still, as his second-term bid got underway Monday, there were abounding signs that the Cruz Texas elected in 2012 — conservative insurgent, political provocateur — is not about to tone it down. At his first stop of the day in Beaumont — and later at a boisterous rally here — Cruz segued from lengthy recollections of Texan heroics to blunt warnings about a dangerous Democratic vision for the country on the line in November. Before Cruz spoke here, supporters were shown a tongue-in-cheek ad depicting the consequences of Republicans staying home this fall, complete with news anchors talking of new Democratic majorities impeaching President Donald Trump and over a million undocumented immigrants suddenly being granted citizenship. When Cruz took the stage, he spent a good chunk of his remarks recognizing a few heroic figures in attendance — people like Stephen Willeford, who sprang into action amid the church massacre last year in Sutherland Springs and helped take down the gunman by opening fire on him with his own gun. “That’s Texas,” Cruz said after ticking through their acts of bravery. “Texas is strong, Texas is independent, Texas is fearless, Texas is free, Texas loves freedom and Texas is tough." The rally at the Redneck Country Club outside Houston — a favorite haunt of Cruz loyalists — came at the end of the first day of a 12-city tour the senator is making across the state through Wednesday. He started it Monday morning in Beaumont with an event billed as specifically about Texas’ resilience following Harvey, which battered the Gulf Coast last fall. Cruz is revving up his campaign almost a year to the day after U.S. Rep. Beto O'Rourke, D-El Paso, launched his underdog effort to unseat the incumbent. O'Rourke has since proven to be a relentless campaigner and strong fundraiser, though Cruz largely ignored him until last month, when he began tearing into his challenger as ideologically out of step with the red state. Cruz did not mention O'Rourke in his remarks to a crowd of about 100 people gathered at an airport firehouse for the Beaumont stop. Neither did he to the Redneck Country Club crowd — an audience so enthused that some members had encouraged Cruz to crowd surf after one particularly well-received applause line. But at each place, Cruz spoke of a crystal-clear choice in November and alluded to what's quickly become his favorite area of contrast with O'Rourke — gun rights — while discussing the recent call by former Supreme Court Justice John Paul Stevens to repeal the Second Amendment. Speaking with the media after his Beaumont appearance, Cruz said a "great question for enterprising reporters" to ask O'Rourke would be if he agrees with Stevens. O’Rourke has spoken favorably of Texas’ long tradition of gun ownership but argued certain commonsense steps can be taken to prevent senseless violence, such as instituting universal background checks and banning the AR-15 rifle. The latter proposal has particularly drawn the ire of Cruz, who reminded reporters Monday that his opponent has bragged about getting an "F" rating from the National Rifle Association — "an extreme position, even within Washington Democrats." O'Rourke's campaign was not letting Cruz's statewide swing go unanswered. It posted a Snapchat filter in Beaumont that allowed users of the app in the area to layer a cartoon of a frowning Cruz atop their posts. The filter also included a jab at Cruz's White House bid, which O'Rourke has said distracted Cruz from representing Texas for much of his first term. Cruz fired back on Twitter, contrasting the number of recent visits he has made to Beaumont with O'Rourke's apparent tally. "Maybe that’s why you lost Jefferson County in the Dem primary," Cruz said to O'Rourke, who promptly responded with a photo of him helping out in Beaumont after Harvey. While Cruz did not mention O’Rourke on the stump Monday, the hometown rally here offered a not-so-subtle reminder.